Taxis in Saigon | Hello Saigon! With family and friends visiting all the time, I’ve been often asked what is my trusted taxi service. And how does one get a taxi from the airport? Getting a taxi from the airport has been quite a concern especially for our visitors arriving via Cebu Pacific flight at 12:30 MN. Not a good time to get to an unfamiliar destination. Before exiting the airport, there is a booth where you can get airport taxi which might set you back around 10 USD or more depending on the destination. Or once you get out of the arrival terminal, turn left and there’s a queue of taxis at the edge of the driveway. Beware of drivers coming to you in casual clothes asking if you want a van or a car. These are not official public transportation and they can take advantage on the pricing. Although I admit I’ve been conned to ride on one before (good there was no untoward incident!) I knew how much I would be expected to pay based on previous metered trips. So anyway, when drivers start getting your attention as you walk out of the terminal, just turn left to the taxi queue. Mai Linh is one of my trusted cabs here in Saigon. They actually have corporate clients so don’t be surprised to see passengers flashing a Mai Linh card in the airport asking the taxi attendant to get them a Mai Linh taxi. 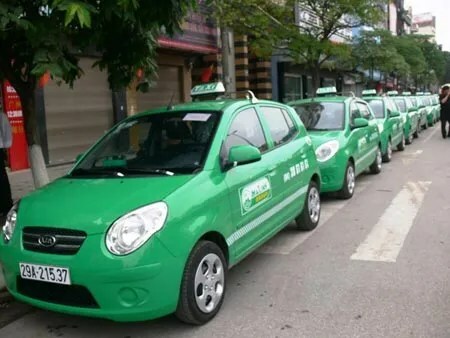 These cabs can be in white and green or in all green. The taxi attendant would be in a green polo shirt uniform and black pants. The driver would be in white polo shirt, green necktie, and black pants. The taxis are Toyota, Toyota Innova, and Kia. When I’m riding alone, I just choose the Kia because the rate is much lower. 😉 These days the flag down rate ranges from 11,000-12,000 VND (a little over 50 cents). Beware of similar taxi service with the name M. Linh with almost the same logo! That’s not the same as Mai Linh Taxi! 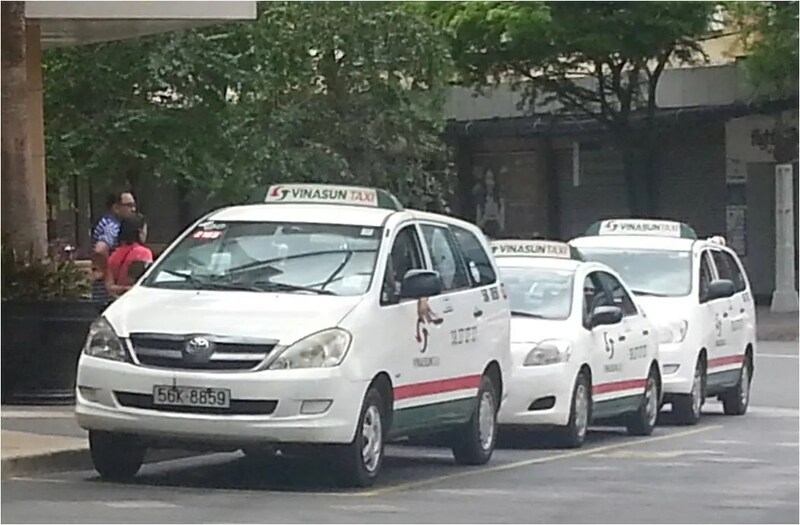 Vinasun taxi comes in Toyota and Toyota Innova with white paint and red and green stripes at the bottom of the vehicle. Again, beware of other cabs pretending to be part of the Vinasun fleet. There’s Vinasum and Vinamet. 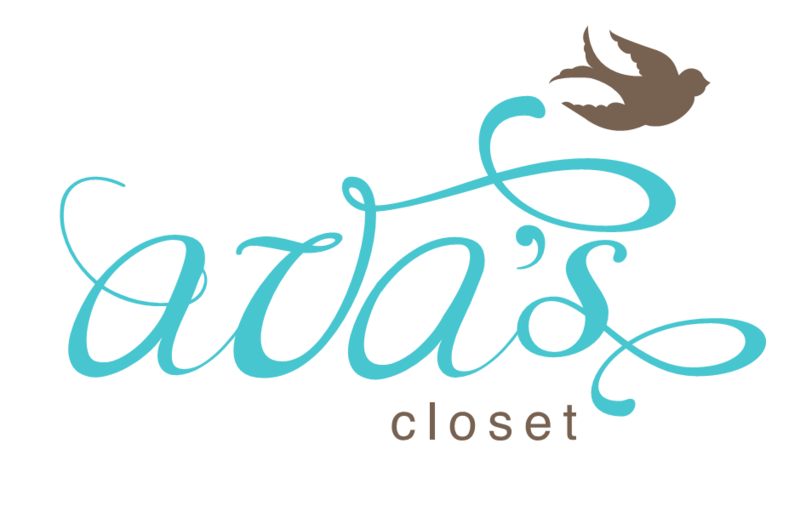 Be careful because the logo and font are the same as Vinasun. Flag down rate for most Vinasun taxis is 12,000 VND. When getting a taxi from another passenger just getting off, close the door first to reset the meter before getting on. Other taxi cabs that I’ve found trustworthy are Vinataxi (bright yellow), Futa Taxi (grey and pink), Petrolimex (white) — a couple of friends rode this before from the airport, forgot their luggage in the trunk but was returned after a few calls, and Sasco (not a whole lot in Saigon but I rode this in Phu Quoc). You’d see a lot of Saigontourist taxis but I’ve had a lot of bad experience getting on one with drivers not using the meter — so if you can, avoid riding this. Also, be careful with your cash because the drivers may not accept folded or torn ones. And if possible, make sure you give small bills because there have been incidents when drivers assume you are not familiar with VND bills and trick you that the 500,000 VND you gave is just 20,000 VND — the blue colors are similar. With that, riding taxis in Saigon is fairly safe. And they never turn you away even if you’re going far from their usual route. This entry was posted in Exploring Saigon and tagged Futa Taxi, Ho Chi Minh City, Mai Linh, Petrolimex, Saigon, Sasco, taxi, Vietnam, Vinasun, Vinataxi. Bookmark the permalink. Great informative post – I always give my visitors the same advice. It’s especially important to make sure you keep the little card the Mailinh/VinaSun guys give you at the airport taxi rank, just in case! I recently took a VinaSun taxi myself from D3-D1 and the driver actually gave me receipt with the amount I gave him and my change! I don’t know if this is something new that they’re introducing? Either way, it was a welcomed surprise! Reach hcmc this morning. Took sometime to figure getting a cab. Once out of departure hall out to your left to the taxi area. Look for a guy in green- Mai linh operator ( you can’t just flag a cab). Some other taxi driver tried offering 300K to district 1 which thanks to this forum I know it’s a ripped off. Managed to ask an airport staff n he called out to the Mai linh operator who was smoking away at some corner with his friends. Went on meter n cost me 120k. Driver did did abit of circling as he weren’t too ask n ask if “turn left?” gosh lucky I printed a map n noticed the roads along the way. Still, glad that he didn’t circle me a few rounds. Pingback: 10 Tourist Tips in Saigon | Hello Saigon! 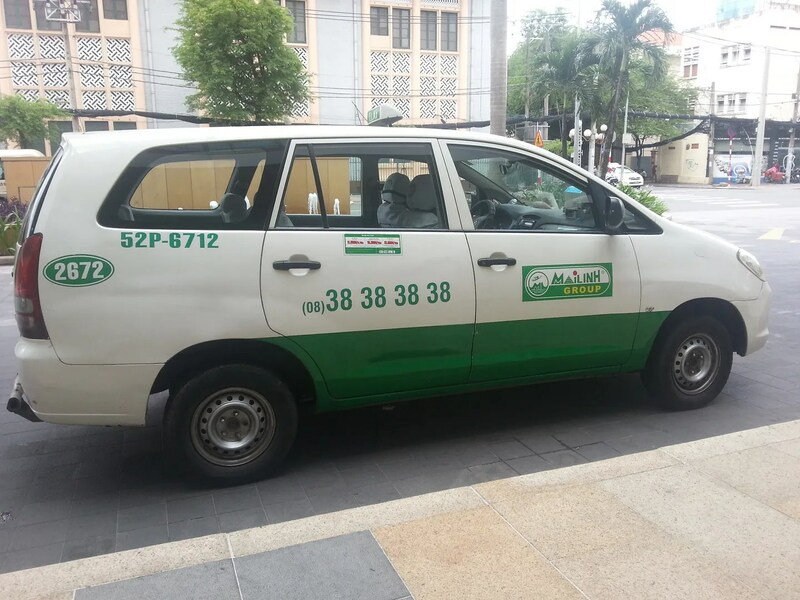 I am very sorry to say this, but in half a dozen visits to Saigon over the course of several years I have never yet encountered a taxi driver who do not try to cheat me (and, unfortunately, several succeeded.) I now make a practice of photographing every taxi before I get in, making sure to get a picture of the taxi company and the taxi number. Wherever possible, I climb out of the taxi at my destination and retrieve bags before paying. If I am confused by the amount, I take my time to figure out a currency conversion, Finally, I simply avoid Saigon taxis wherever possible. If I am staying in a hotel, I ask the hotel to arrange airport transfers, and pay the hotel directly. Sorry to hear that Donald. Hi Lyra! I’m also a Filipino and this is my first time in HCMC. I’ve been here for just 7 days. I find your blogs very helpful and consoling. For a first timer in Vietnam, the new environment can be very intimidating. 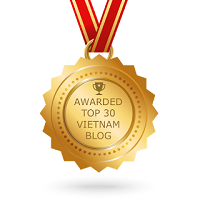 I am looking forward to reading more of your blogs! HI, We are a group of 5 going to HCM. Would you know if there are restrictions regarding the number of passengers in a taxi? Will they allow 5 passengers in 1 taxi?